What’s Your Favourite Fantasy Weapon? In my fantasy world Yos, where my three-book Jakirian Cycle is set, all metal is present as a magical crystal called a glowmetal. These glowmetals are a naturally occurring blend of light and metal that cannot be created or destroyed. So in the development of weapons, swords and metal armour were out. Instead I developed various classes of composite ceramic. What your favourite Fantasy weapon? Scytheman ebook free on Kindle! Hi, everyone. To celebrate the release of Sorcerer as an ebook, I am offering Kindle copies of the second book Scytheman free for three days from Tuesday 4th February to Thursday 4th February (US time). I am also running a coundown deal on the first book The Calvanni, which will be available for $0.99 from Tuesday stepping back up to its usual price of $4.99 on Friday. The third book in my Jakirian Cycle, Sorcerer, is available as a Kindle version here on Amazon. Both electronic and print versions of all three books in the Jakirian Cycle – The Calvanni, Scytheman and Sorcerer – should now be up on my Amazon author page. Here is a run down on Sorcerer. . .
Raziin or use the power of the Spear to save Yos. Supanova is here (and so are the ebooks)! As I write this Supanova has kicked off at the RNA Showgrounds in Brisbane. I’ll be there over the weekend (9-10th November) with bright shiny new copies of my Jakirian Cycle (for those from USA, Supanova is the Australian version of ComiCon). I’m be taking pics of the cosplay and posting them next week. There are usually some great costumes, and I’m sure this year will be no exception. I’ll be sitting at my table in Artist’s Alley (in the RICC building) with fellow Queensland writers Rowena Cory Daniells (of former MGC fame), well known for her King Rolen’s Kin series, and Cheryse Durrant, who has just released her new book The Blood She Betrayed. 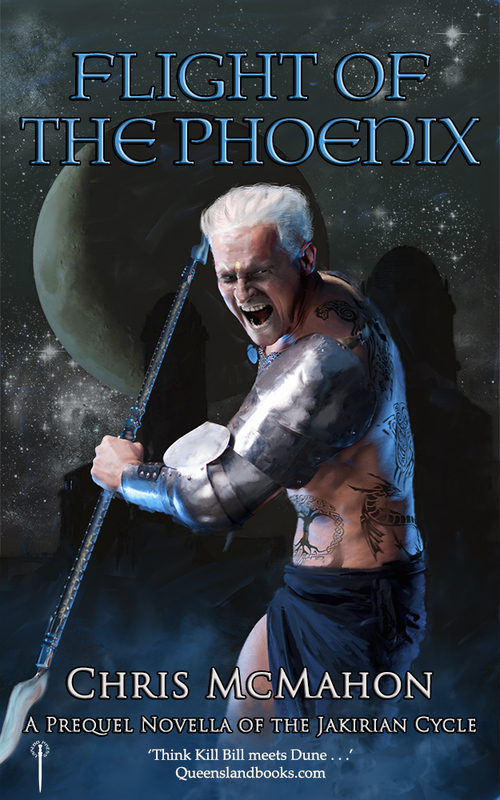 The Jakirian Cycle comprises three books, The Calvanni, Scytheman, and Sorcerer. All three feature great covers by Daryl Lindquist. I’m excited to say that Calvanni and Scytheman have been released as ebooks. They are available here on Amazon. Just in case you missed it here is a run-down on the Jakirian Cycle. . . Think Kill Bill meets Dune . . . Heroic Fantasy in world of ceramic weapons where all metal is magical . . . In The Calvanni, the cavern-dwelling Eathal have emerged to wreak their vengeance on mankind. The fate of innocent thousands rests on finding the Scion – lost heir to the fallen Empire. The Temple has outlawed the ancient practice of Sorcery. Its Druids dominate religious and secular power, but are ill-equipped to resist an unknown evil once contained by the Emperors. Scytheman follows on from events in The Calvanni. The city of Raynor is now in turmoil. False-Scion Osterac has declared himself heir to the fallen Empire and his supporters riot on the streets. Legions of non-human Eathal advance across the continent, destroying all in their path. The future of Yos lies in the balance and only the Scion can unite the shattered fragments of the fallen Empire. Pursued by the renegade Sorcerer Raziin, Cedrin and Ellen struggle to stay alive on a lawless continent torn by war. They are drawn toward a lethal contest for the awesome power of the Spear of Carris, where the identity of the true Scion will be revealed. The three books follow Cedrin and Ellen as they face deeper and more hidden threats. Eventually they must face a final challenge as the most ancient secrets that bind their bloodlines are revealed. I can’t tell you too much more about Sorcerer without spoilers. If you are planning to attend Supanova Brisbane be sure to drop in and say hi. Hi, everyone. I’ve finally made it through the ebook maze! The Calvanni and Scytheman – Books 1 & 2 of the Jakirian Cycle – are now available on Amazon! Hi, everyone. I’m planning to be at Supanova Brisbane 9-10th November with my newly hatched Jakirian Cycle (for those from USA this is the Australian version of ComiCon). I’m expecting to be hugely entertained by the cosplay and the usual antics of the crowd as I sit at my table in Artist’s Alley with fellow Queensland writers Rowena Cory Daniells and Cheryse Durrant. 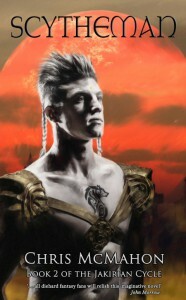 The Jakirian Cycle comprises three books, The Calvanni, Scytheman, and Sorcerer. Check out the covers. All three are very much in the ink-and-paper realm and I’ll have a ton of copies with me at Supanova. I’ll also have a pull-up banner designed by Daryl Linquist, who was the cover artist for the books. Check it out below. I love the way Daryl has touched the edges to turn the banner into an artwork. 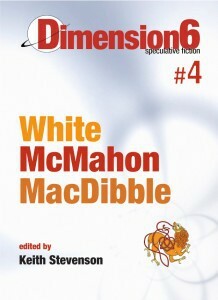 The kindle versions should up by Supanova. I’ll be sure to make an announcement. Stay tuned for some promotional offers. 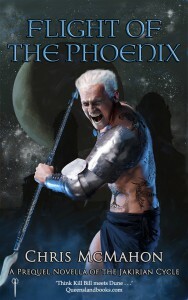 The Jakirian series is Heroic Fantasy set on the world of Yos, with unique ecology and twin suns, where all metal is magical and control of magic is the basis for power. The setting includes fantastical magical artefacts such as glowmetals, ceramic weapons and an array of new creatures. In The Calvanni, the cavern-dwelling Eathal have emerged to wreak their vengeance on mankind. The fate of innocent thousands rests on finding the Scion – lost heir to the fallen Empire. The Temple has outlawed the ancient practice of Sorcery. Its Druids dominate religious and secular power, but are ill-equipped to resist an unknown evil once contained by the Emperors. The three books follow Cedrin and Ellen as they face deeper and more hidden threats. Pursuing them is Raziin, a vicious renegade who seeks to claim the ultimate power of the Spear of Carris for himself. Eventually they must face a final challenge as the most ancient secrets that bind their three bloodlines are revealed.